What’s her genre of music? Her genre of music isBrazilian Music which consists of, well, let’s just say a lot and you can seethe list here. Has she had any albums? 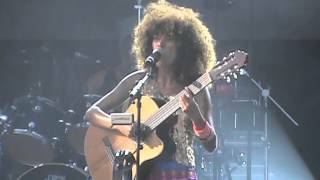 Her latest album wasreleased this year and it was called Mundo Meu; her previous albums are:Bossa Muffin, which was released in 2011 and Bossa Muffin: Remixes &Inedits, released in 2013. Any singles released? Flavia has had 5 singlesreleased, they are as followed: ‘I Want to Marry (Soundtrack)’, ‘Sunshine’,’Bossa Muffin’, ‘O que sou – From Paris to Rio’. If any of you Wicidites have all seen the Soundcloudlink, to me it sounds slightly like a Eurovision Ethnic feel, but I like the song anda few other songs from the album. Overall I think Flavia Coelha is a good artist, butI’m not really a fan of Jools Hollands show on BBC so I can’t really say much asI haven’t heard her live before I did research on this wonderful artist. Well, not long now, guys. Eurovision month is upon us! My top 40 will be revealed after the contest as I will be reviewing all 3 contests as soon as they all finish. I can’t wait to share myexcitement with you all to see who wins the 60th Eurovision Song Contest. Did Imention the stage looks amazing?